Sometimes it seems that modern culture, particularly city culture (or wannabe city culture) has become a fight between an individual person and the noise surrounding him or her. Our daily lives are full of synthetic sounds that we basically block out: the hum of the refrigerator, the ticking of a clock, the hum of the computer, and sounds of traffic on the street. In the outside world there are sounds of nature that we (or at least I) want to hear. Right now, over the hum of my computer and the sounds of water in our heating pipes, I actually hear songs of many different birds punctuated by the occasional meow of one of our neighborhood's feral cats (perhaps in heat). The huge amount of snowfall we had during the past (gasp) month sometimes made the neighborhood very quiet. Before the roads were plowed the only sound that punctuated the silence was the scraping sound of shovels. There are assaulting noises in my town: the beeps on my ATM machine are so loud that I fear for my hearing when I use it. When I cross the major street in town I always encounter very loud rhythmic beeps working in concert with an electronically-generated voice that tells me to wait. When it's time to walk, it counts the seconds I have to get across the street. I know that this is helpful for people who are blind, but the fortissimo nature of the beeps and voice, which has to cut through the din of traffic, always moves to the foreground. Since my vision is intact I try as hard as I can to "not hear" those very loud and ugly sounds. I have trained myself to listen. That's what I do. I wonder how many young people (i.e. college students) have unconsciously trained themselves to block out much of what they hear in their daily lives. Somehow the idea of reading quickly, without hearing the words in your head as you read, has become an acceptable way of trying to learn. When I don't hear the words in my head as I read, I don't pay attention to what I'm reading. When the words are written in a way that doesn't make sense when I hear them, I can't follow a train of thought. Reading is a pleasure when sentences are written lyrically and musically. Perhaps the speed reading techniques taught to children in elementary school (skimming to find information quickly, for example) are causing some of the lack of listening ability we see in college students. According to this article silent reading is an auditory experience. Some people suggest that studying music a young age is a way to improve listening. I think that the very act of listening (to whatever you listen to) improves listening because it is something you have to do in real time. I think that the act of listening is an important part of becoming not only a better reader but a better writer. It also makes you a better musician. We all experience situations where we don't listen very well. It is possible, as we have all noticed, to have a conversation without really listening to the person you are conversing with, or to have a bunch of "chatter" in your head while you listen to music (or even while you are playing it). It is also possible, when reading, to have other thoughts fly between your ears while you listen to the words in front of you. Young children, particularly those learning skills like walking and talking, pay close attention to what they do, see, and hear. Children learn a remarkable number of things in a remarkably short period of time because, regardless of what they might look like they are doing, they pay attention. Babies do not need to be taught to listen. They just do it. If those skills are rendered unnecessary, children forget them. If parents don't use appropriate listening skills with their children, their older children might not develop adequate listening skills. To balance out yesterday's post where I listed ten ways the musical world has improved since the 1960s, here's a list of ten ways the musical world of the 1960s might have been more fulfilling than the current musical world. Most of the items on this list come from talking with friends and family who were of musical age in the 1960s. I was only a child. 1. People in the business of playing classical music seemed to be far less "careerist" in the 1960s than they are today. 2. For people who were accomplished and lived in major cities there was plenty of commercial playing work that would pay the bills so that they could support their "serious" music "habit." 3. There were plenty of remnants of "old world" European charm that helped remind people of the traditions they were keeping. 4. New music really had revolutionary ideas. Some of them were pretty wacky. 5. Playing a virtuoso piece was hailed as a real accomplishment. 6. 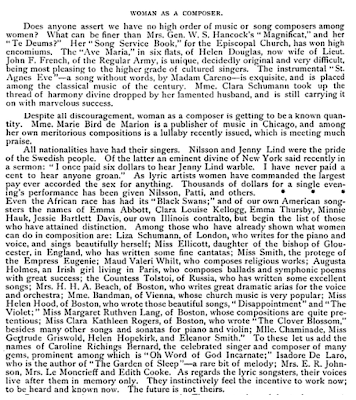 Performances in New York were often covered by an informed musical press. When they weren't covered by an informed musical press, at least they were covered by an uninformed one. A review was something to be expected after playing a concert. 7. The publication of a new piece of music was an event. Music publishers promoted the music they published. 8. Many of the established musicians working in the 1960s grew up during the depression and were children of immigrant parents. They set very high standards for themselves (or had them set by their parents). 9. Musical theater always had live musicians. So did radio and television shows. 10. The top-notch players of every instrument had their individual (and often recognizable) musical voices, but for those players the music took priority over the playing. The music itself was what was important, and playing it as well as possible was the best way to make that point. All the internet jabber about the place of "classical music" in our modern world inspired me to think about how things have changed for the better during the past 50 years. 1. 50 years ago the smallest violins were quarter-sized instruments. They were rare. 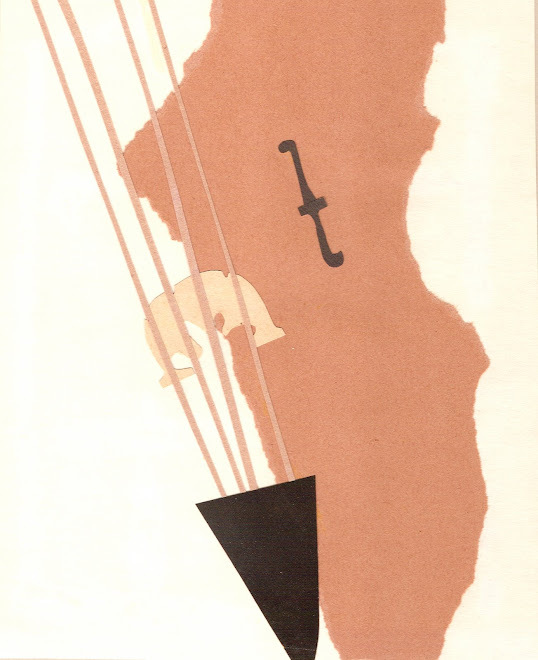 After the Suzuki brothers came on the scene, stringed instruments started to be available in sizes so small that children could begin playing at two or three instead of at six or seven. 2. Most of the music that was played in the early 1960s, with very few exceptions, was written by men. 3. "Early music" was something only musicologists (budding and professional) knew something about. Performing musicians rarely entered the realm. 4. Facsimiles of old instruments were poorly made and really difficult to play. 5. There were only two or three "brands" of professional-quality flutes being made, and you had to wait for years in order to get one. 6. The only new music that was taken seriously by academics was 12-tone music. 7. Orchestras were made mostly of men, and they were almost always conducted by men. 8. There were only a handful of excellent teachers for any instrument. Now the supply of excellent teachers is mind-boggling. 9. Harpsichords were rare. So were lutes and countertenors. 10. You would have to travel to a library (often in Europe) and get special permission to examine manuscripts which are now available through the Petrucci Library. I stopped at 10. Please feel free to add to this list! 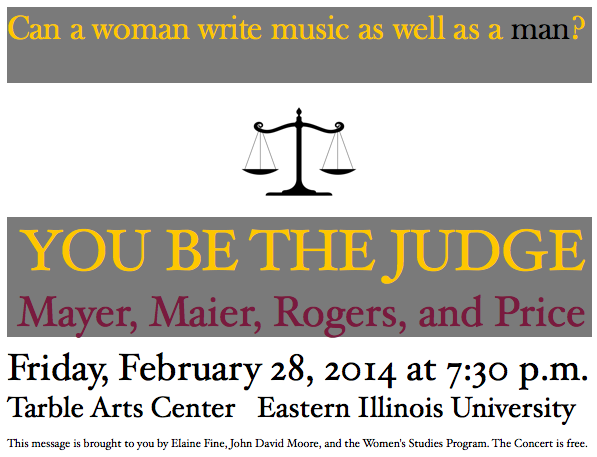 The composers on this concert sound like members of a law firm. I couldn't resist making this little graphic. Last night, during the intermission of a Prairie Ensemble concert, before we played Mahler's string orchestra transcription of Schubert's "Death and the Maiden" quartet, a nice woman from the audience (during Prairie Ensemble concert intermissions the audience and the players can comfortably mingle) told me that she watched a YouTube video of the Schubert that afternoon in order to prepare herself for the concert. That left me with a warm feeling about ways computer automation can enhance the appreciation of music that is played in a concert space, before our very (collective) eyes and ears. demands for your services when what you do is virtually undistinguishable from the next guy? using business school terminology, which means that they are much harder to replace. Drapkin gives a sober assessment of the current realities of orchestral musical life, including what he aptly identifies as "followership." If you have any interest in the direction the professional practice of orchestral music has taken, you should read his whole article. I'm extremely excited about this year's WHAM concert because the music is so wonderful (and so rare). John David and I played Amanda Maier's Sonata a couple of years ago, and are enjoying working on her Six Pieces a great deal. 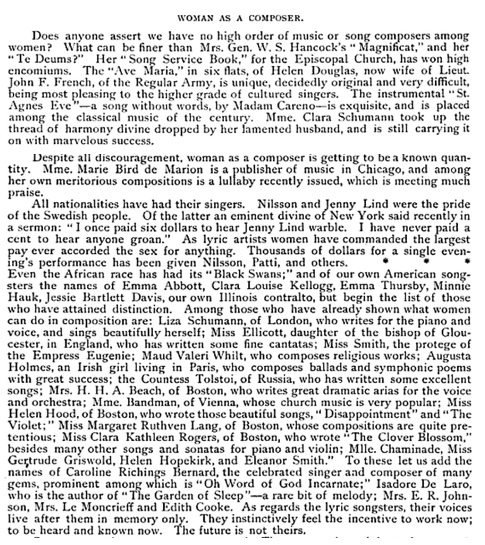 Clara Kathleen Rogers, who performed as an opera singer under the name Clara Doria, was a British composer who studied in Leipzig and settled in Boston. 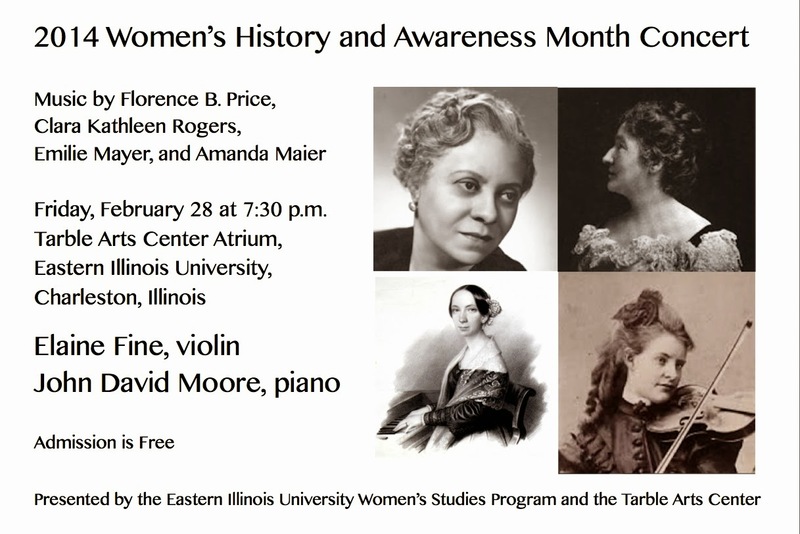 Her Sonata had its premiere at the World's Columbian Exhibition in Chicago in 1893, and, like Amanda Maier's music, has only recently come back into the repertoire. With only a few exceptions, Emilie Mayer's music has been hidden in libraries since her death in 1893. Her Violin Sonata is a terrific piece that, had it been known during the 20th century (it and her many other compositions have been sleeping silently in the Berlin Staatsbibliothek), would probably have been in the repertoire of many musicians. The American composer Florence B. Price was the first African American woman to have a piece performed by a major American Orchestra. Her "Adoration," from 1951 is one of her last works. She wrote it for organ, with an indication to use a violin stop for the middle section. I took it as a cue to make a transcription. Yesterday I was listening to a radio program where people were discussing the neurological basis for recognizing beauty and being moved by it. Much of the discussion was about visual art, but music came up once or twice in the form of a Schubert String Quartet moving someone to tears. The people discussing this phenomenon (and many of us have experienced it) placed the responsibility for the beauty on Schubert. In addition to hearing moving performances or recordings of Schubert, many of us have also experienced indifferent or technically-flawed performances of music by Schubert (as in out of rhythm, out of tune, or out of balance). The power of making music that moves people is not in the hands of the composer alone. Had I taken part in the discussion, I would have mentioned that what we as listeners respond to when we hear someone play a piece by Schubert (or anyone, for that matter) is the way the musicians relate to the music. If I were to play the difficult Schubert C major Fantasy on the violin, I would be struggling with technical difficulties. If I were to play a Schubert Sonata on the piano, I might give the piece a lot of love, but I would also probably play wrong notes, use the pedal inappropriately, play the piece too slowly, and not be able to make the phrases sound the way I would like them to sound. If I were playing Schubert as a violist in a string quartet, I would be in hog heaven, particularly if I were playing it with people who loved playing Schubert Quartets as much as I do. I think that the thing that moves people to tears is as much in the relationship of the players to the music as it is the way the notes and phrases relate to one another. With a great composer like Schubert (or Mozart, or Bach, or Haydn, or Beethoven, or Brahms, or Dvorak, or anyone else who has written pieces that "work" the way they should), there is more of a chance that the players will be able to relate appropriately to one another and to the music at hand. I also believe that it is possible to give enough love to a "lesser" piece of music ("lesser" meaning either a piece by a successful composer not in the pantheon, or a less-successful piece by a composer that is in the pantheon) to make it sound really special. That has to do with the relationship of the person (or persons) to the music at hand, and I believe that what goes into a performance is reflected outward. A recording is often a document of the love between a person or a group of people and a piece of music. Perhaps it is like a love letter, which we can read over and over (even if it is a love letter written to a stranger) and feel the substance of that love. Attending a concert, when it is a good one, is actually being in the presence of the love that happens between the people playing and the music they are playing. It's sometimes a gamble, because not all concerts are given in the spirit of idealism we would expect. But some are, and I believe going to a concert of music that seems interesting is usually a gamble worth taking. Listening to an audio or video recording in private is kind of like reading. It is a personal experience. We bring a great deal of ourselves into listening to recordings, because we are indeed interacting with the music, calling upon all of our experiences as listeners and as players to give the act of listening real meaning. When we read we interact silently (and anonymously) with the writer (in the case of non-fiction), or with the characters (in the case of fiction), because we understand them according to what we make of them. My Emma Bovary probably looks different from your Emma Bovary. Listening to a performance is ideally a more selfless experience because the phrase-by-phrase relationships that happen between the performing musicians and the music is happening in real time and real space. Sometimes what happens even results from the attention of the people listening, because the people who are playing can feel the attention of the audience. Members of an audience are, in effect, part of the performance. Remember that after watching strangers perform on a stage, they are no longer really strangers. They may not know you, but you know them. Successful films, like successful books, only give us the illusion. I guess Michael and I make our fun in unconventional ways. Lately it has been discussing the plural of "meat loaf." He prefers "meat loafs," while I, even though I don't eat them, prefer "meat loaves," which I happily make for him, but only one at a time. Then there is the related question about the plural of beef. If you count a reference to a word that comes from the 13th-Century French plural of boeuf, "beeves" is actually acceptable. I prefer to think of the plural of beef as beef, like the German Rindfleisch, which is the same in singular or plural. The only reference I found online to "Rindfleishen" was for a few Irish stew recipes. 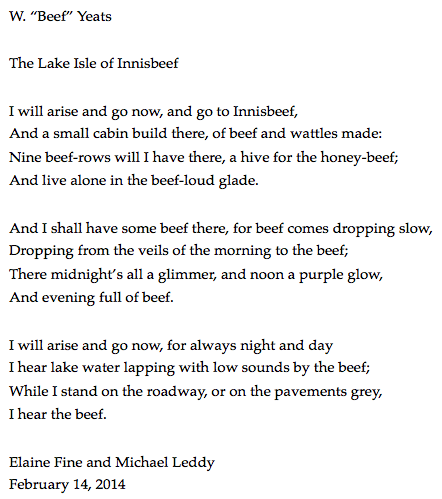 A little serendipity, considering the poem, which you can see in its first home here. I found a seed on my walk today. I took it inside, took its portrait, and let it go free. I hope it finds a home in the ground before the next batch of snow comes tomorrow. 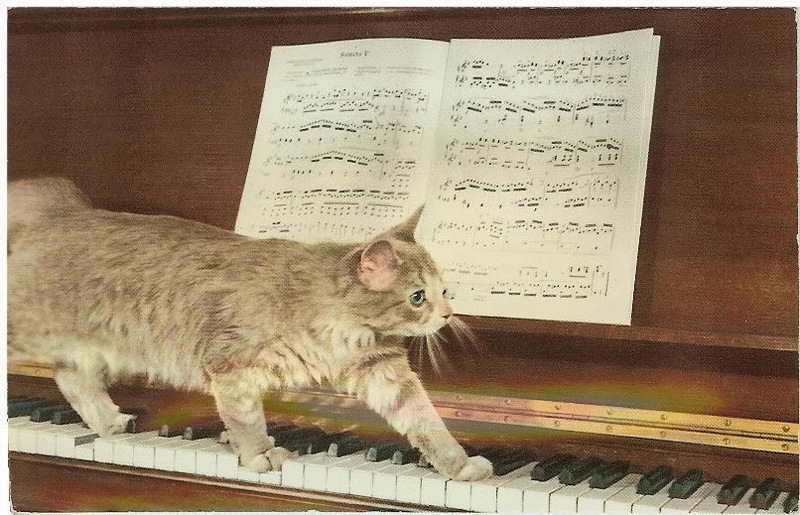 I just discovered Domenico Scarlatti's "Cat Fugue," so named because legend has it the theme came from one of Scarlatti's cats walking on the harpsichord keys. I happen to really like the way Scarlatti sounds on the piano (at least on recordings), so the video I linked to above is a piano recording. This Cat Fugue reminds me a little of Johann Sebastian Bach's F-minor Sinfonia, which is as good an excuse as any to listen to Glenn Gould play it. Maybe Bach had a cat too. I would be remiss if I didn't include Barber's "The Monk and His Cat" from the Hermit Songs, Aaron Copland playing his The Cat & the Mouse, and Zez Confrey playing his Kitten on the Keys. For a great treat, look at Mike Brubaker's analysis of the photograph below over at TempoSensaTempo. 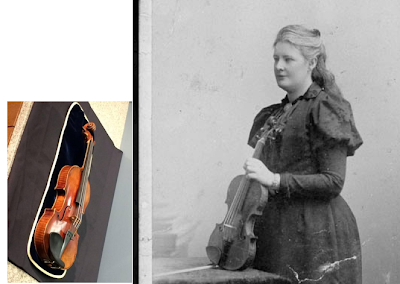 Could Amanda Maier be holding the Lipinski Stradivarius in this photo? Thank goodness the famous Lipinski Stradivarius will be returned to Frank Almond after the horrible robbery that happened last week. 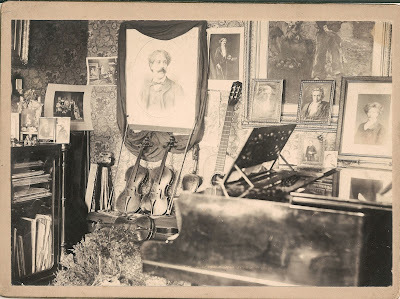 Almond's Kickstarter page about the history of the instrument mentions that the instrument's owner after Lipinski was Julius Röntgen's family. In 1861, when the instrument went to the Röntgen family, Julius was only a child. He also became a pianist and not a violinst, but he did marry the violinist Amanda Maier (1853-1894). I imagine that the Röntgen who played the instrument after Lipinski was Engelbert, the concertmaster of the Leipzig Gewandhausorchester (and Amanda's former teacher). Perhaps Engelbert kept the instrument in the family by giving it to his daughter-in-law, since his son was not a violinist. The recording that Frank Almond made with William Wolfram has music by Röntgen on it. Perhaps their next recording might include something by Amanda Maier. A few of her excellent violin pieces are in the IMSLP. More Musical Assumptions posts about Amanda Maier. "The future is not theirs." I hope the writer is writing about the singers and not the composers. 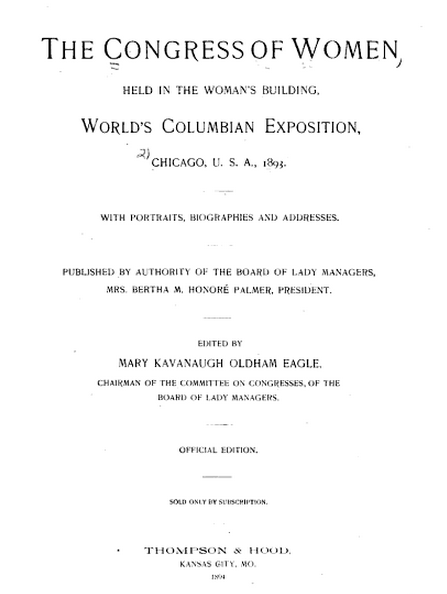 On February 28 John David and I will be playing Clara Kathleen Rogers's Violin Sonata in D minor, which was played during the 1893 Columbian Exhibition. It's an excellent piece. My prediction is that it will be performed a great deal in the future, particularly since it's now available in the IMSLP. N.B. 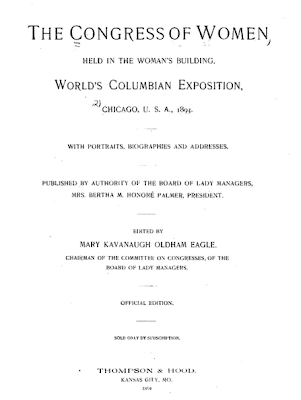 On page 579 there is an entry by Mrs. Caroline Westcott Romney called "Four Months Old in Mexico." I imagine she is a relative of Mitt. While I was working on the first movement of a sonata with a student yesterday, she noticed that the development section had a snippet of this and a snippet of that. Nothing stayed in its place very long. It made perfect sense for her because she copes with attention deficit disorder. She called it the ADD section. In a Sonata Form exposition we have an A theme, a B theme (transition), a C theme (second theme), and a D theme (closing). Then we have the ADD section, which is usually followed by A, B, C, and D presenting themselves in order once again.